"This bowl of noodle goodness was made possible by all the local farmers in the DC Metro area. Thank you for your dedication to cultivating and offering fresh, locally grown veggies. I use Nature is Delicious® non-fried Korean ramen noodles. Noodles, nutrients, spice. 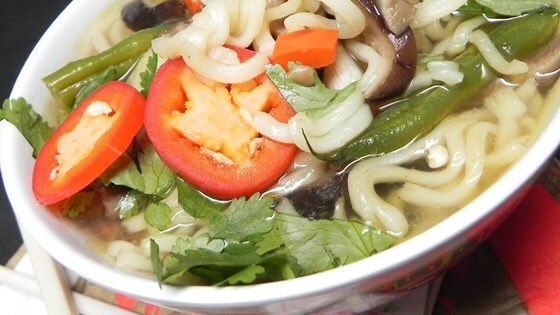 I can't think of a more perfect bowl of tasty, spicy, healthy bowl of slurpiness." 1Bring a large pot of lightly salted water to a boil. Add green beans and cook uncovered until tender, about 2 minutes. Drain in a colander and rinse with cold water to stop the cooking process. Drain. 2Heat olive oil in a small skillet over medium heat. Add chopped garlic; fry, stirring often, until golden brown, 2 to 3 minutes. Remove from heat. 3Combine chicken broth, water, red chile pepper, and sliced garlic in a pot. Bring to a boil; simmer until flavors combine, about 3 minutes. Stir in soy sauce, fish sauce, black pepper, and rice wine vinegar; simmer for 2 minutes. 4Stir green beans, ramen noodles, and seasoning packet included in the package into the pot. Cook until noodles soften, about 3 minutes. Stir in enoki mushrooms; simmer until tender, about 2 minutes. Add scallions; cook until wilted, about 1 minute. 5Ladle noodles, green beans, mushrooms, and broth into a bowl. Top with basil and cilantro leaves. Sprinkle fried garlic on top. Substitute vegetable broth for the chicken broth if desired. Substitute baby bok choy or spinach for the green beans if desired. Skip step 1 and add with scallions in step 4.